Lamborghini was in the news last year for customizing a Lamborghini Huracan RWD that was gifted to the Pope. His Holiness decided that instead of using it, Lamborghini’s generous gift should be auctioned off to raise funds for charity. Sotheby’s held an auction for the vehicle in Monaco and the final bidder offered a price of 715,000 euros (USD 813,000) for the vehicle. 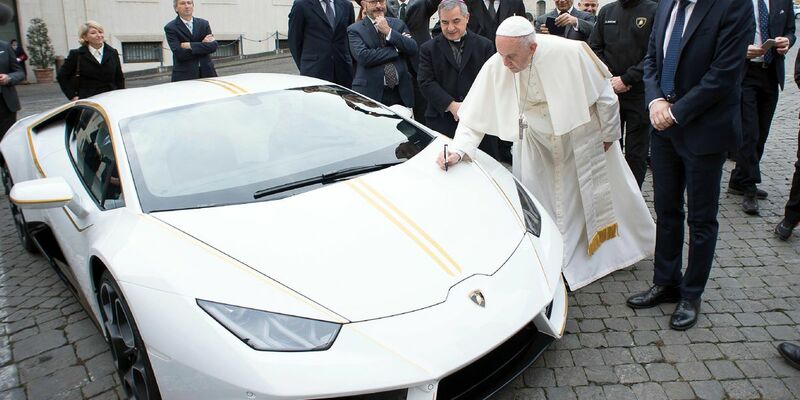 However, he decided that he would not proceed with the purchase and now the Lamborghini Huracan that was meant to be a vehicle for the pope is being offered as the prize in a raffle draw for which a ticket costs only USD 10. According to a report on the Omaze fundraising page, the winner of the vehicle will not only get a new Lamborghini Huracan but will also get free airfare to Rome, free hotel accommodation in a four-star hotel, and will be the main guest at a private ceremony attended by Pope Francis and Lamborghini CEO, Stefano Domenicali where the Lamborghini which has been signed and blessed by the Pope will be handed over to him. The funds obtained through the raffle will be used for the reconstruction of villages that have been destroyed as an outcome of violence and war, to aid victims of human trafficking, and to provide medical care and education to those living in poverty. The funds that will be obtained will be disbursed through Charities Aid Foundation of America. The major chunk of the amount raised will be given to the Pope John XXIII Community — a charity that specializes in helping women who were victimized by human trafficking at the hands of ISIS.